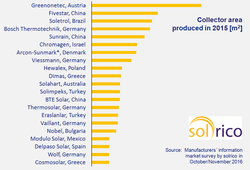 The annual ranking of the largest flat plate collector manufacturers was recently published on solarthermalworld.org. The ranking is based on a survey among the largest industry players carried out by solrico in October and November 2016. The ranking is headed by the same four companies as last year: Greenonetec from Austria, Fivestar from China, Soletrol from Brazil and Bosch Thermotechnik from Germany. But aside from the continuity at the top, last year shows what different paths some markets have taken. Whereas Australian-based Solahart, one of the pioneers of global solar collector trade, as well as Soletrol, the largest Brazilian manufacturer, have lost ground, several others – such as Sunrain from China, Hewalex from Poland and Eraslan from Turkey – were able to report above-average growth for 2015 and rise through the ranks. The produced collector area of the overall 21 companies added up to 4,212,462 m². The number was 21 and not 20 because the last and second-last spot were occupied by companies with equal production output. Dear the complete article on solarthermalworld.org.